Credit score is a three digit numbers which is generated from your credit report by using mathematical algorithm. It is a numerical expression based on analysis of a persons credit file which shows the worthiness of an individual. Let's take an example - If a person applies for loan in a bank then the first thing banks will do is to check for the persons credit score. If the person is clear in that report then he will get the loan. The credit score bureaus presents the score of an individual in the report between 300 to 900 scores. The highest the persons credit score is, the more he is trust worthy. 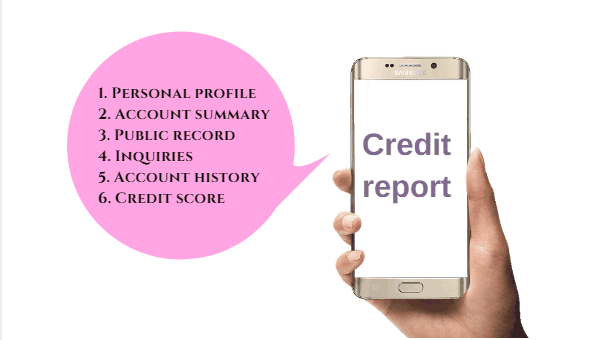 Credit report is the report prepared by a credit report/score bureau, which contains the credit scores of a person on the basis of the records submitted by banks and NBFC's. This record is the history of a persons financial life. Each and every activity that you do related to banks and your credits is covered under your credit report. Whatever you do like if you take any insurance then either you are paying the EMI's on time or not, if you are paying credits of your credit card or you are taking too long to pay it, all this information is reported to your credit score. Just like your wrong moves credit score has your good reports also. If any person pays his EMI's and premiums on time and is very punctual with his monthly transactions and balance maitenance then he will get an excellent credit score. What does your credit report shows? Everything about your loan including loan date, tenure, amount, outstanding etc. Your repayments to the debt, either you are paying it on time or you are late in your monthly returns. Whether you are guarantor to someone with good or bad credit report. Your credit card history either you have it or applied for it. If you have it then either you are repaying the credit on time or you are paying only the minimum limit. Either you have any loan settlement with any bank in your past financial life. If you have any insurance policy then which one is that, either you are paying it's premiums on time or not. How many inquiries have you made till date for any loan, insurance or credit. Either you applied for it or not. All the applications you made for any loans or insurance till date. Either they are accepted or rejected. Banks or NBFC's send the data history of an individual to these companies and then as per those data these bureaus prepare the credit report of that person. This report contains everything from his debts, repayments and also the inquiries he made. These companies make money by providing credit reports to the consumers or the lenders by charging fees on this report. 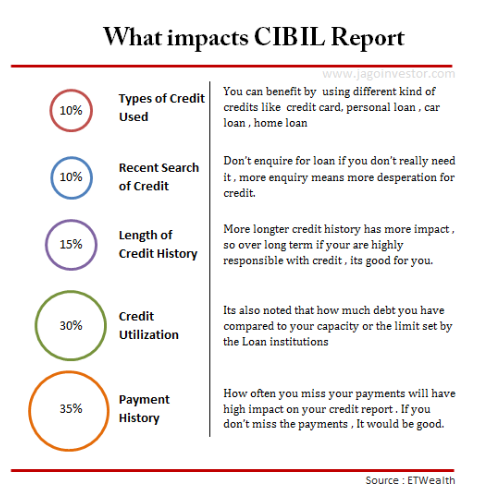 Out of these agencies CIBIL is the well known and most authorized credit score reporting bureau. And that's why credit score report is also called as CIBIL score report. CIBIL i.e. Credit Information Bureau of India Limited is a well known and authorized credit reporting bureau established in year 2000, headquartered at Mumbai. Each and every bank needs to send its account holders credits to CIBIL and then CIBIL helps them back by providing your credit report whenever needed. The main objective of CIBIL is to track the credit history of an individual or a company and report their creditworthiness. Having a good CIBIL record helps the consumers to avail all types of loans and credit cards easily and with good interest rate. Whenever you apply for any loan or credit to a lender or bank, the lender first asks for your credit record to the CIBIL and check for your credit score and status of your financial history. After that the lender decides that either they should accept or deny your application. Your personal information like your religion,age, gender, marital status etc. You employment status like your designation, salary, joining date, resigning etc. (In some cases lenders may ask for some of this information). Today's economy runs on credit scores. Your three digit credit score defines your trustworthiness in your financial life. It is a key of your financially stable life. In the countries outside India it is difficult to get even an apartment also with a bad credit score. Because trusting a person with bad credit history is supposed as a risky deal. An individual with a poor credit score is considered as a risky bet. There is a possibility that in India also it will be difficult for a person to get a job with poor credit record. It is not necessary that your CIBIL score or Credit score is always bad. As I have said earlier it can be good also. It is actually a good concept because with the help of this report bank can identify how trustworthy a person is while lending money. Suppose there are two persons 'A' & 'B'. 'A' has a good Credit score and 'B' has a bad Credit score, then it is obvious that 'A' will get better advantages of interest on loan and on his savings also than that of 'B'. 'B' will get the loan at higher interest rate than A because it is risky for banks to give him loan and sometimes many banks can also deny his loan application. To maintain a good Credit score is essential for every individual because it is useful for further bank related procedures like applying for loan, taking insurance and much more. Credit reporting agencies are the powerful institutions. Just one wrong move and you credit report status can be spoiled for years. If you ever made any inquiry regarding loan or credit card that means you have created you credit history which will be recorded in your credit report by these credit bureaus. If a person thinks that he don't have any bank account, or credit card or any of loan/debt and thus he don't have any credit history then it is also a negative side. Consumer applies for credit / loan to the lender. Lender sends request for the credit report of that particular consumer to the credit bureaus. Credit bureaus send the report which they prepared by collecting the data of the consumer reported by all other lenders like banks and NBFC's. A person can request for his own credit report also. These credit bureaus charge some fees for every report and in this way they make their money. Your credit report is a snapshot of your financial life. So reading a credit report is also as much important as to maintain it. A person can improve his credit report if he can read it and understand it, because only then he can know the mistakes happened with his financial status. Now you must be thinking, why is this record too much important? Every time you apply for the loan or credit, your credit report is asked by the lender. Some employers as well as landlords and companies also check your credit record before signing any agreement or business with you. By considering all these things in mind, you must have realized how important a credit report is in a persons financial life. Now lets have a look at the the important factors which you should take into consideration while reading your credit report. Once you get your credit report in your hand there is a possibility that you may get confused by seeing the alphabets, abbreviations, terms and numbers in that. The first thing you will observe in this report is that there will be some sections in which your all the information will be covered. You have to go through each and every section deeply to understand the complete report. Sometimes there is a possibility that you can see some irrelevant or wrong information reported in your record. So it is better if you go through the report carefully and identify these kinds of mistakes and report them to the lender and the credit reporting agencies. Which sections are included in credit report? There are various sections in with the help of which it will be easier for the lenders to see what exactly they wanted to check in your report to approve your application regarding loan or credit. This will be the first section in your CIBIL report which shows your personal data. This sectional includes your current name (your previous name in case you have another one earlier and changed later or if you have any nick name or short name), security number, address etc. From this section you can identify that the report you have got is your own report or you got the wrong one by mistake. So before checking for other details, go through this section carefully and confirm that it is your report. Hereis the picture of personal information section in CIBIL record. This is an overview of your financial history. This section covers the information of your financial history. IT includes your account details, number of accounts, balance and transactions in each account, your loan history, credit card history, payment history etc. If you want to know your credit report in short time span then this section will help you. Here you can see if there are any mistakes or flaw's in credit report. This section shows your record if there is any, like bankruptcies, tax liens, any court proceedings, your credit worthiness etc. It is also called as legal record. Having a legal record on your credit report can damage your credit score. Though they do not contain lore about your non-financial record. This section covers the inquiries made for your credit report by you as well as by the lenders. There are two types of inquiries covered in this section, 'Hard' and 'Soft'. Hard inquiries are the inquiries made when you apply for any credit. Soft inquiries are the inquiries which are not related to your credit applications. When a lender asks for your credit report then they can see only the hard inquiries. The soft inquiries are shown only on the persons own record report. Here given is the image of inquiry section of cibil report. 'Account history' is also called as 'Account information'. It is the detailed information about your bank accounts, such as number of accounts, account balance, payments etc. This section is known as the heart of your credit report. You can also remove the information from this section if you fount it irrelevant or too much old like before 7 years. Credit score or it is also called as score tab, is the final result of your overall credit record. This section includes your credit scores, credit rank and your credit level. This is the section which is most probably checked by the lenders to decide your creditworthiness. 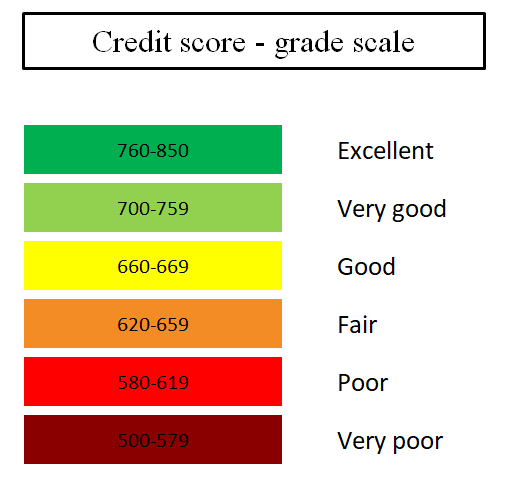 Here in this section the good and bad factors that are affecting on your credit report are also mentioned so that you can track on your own mistakes and can avoid them to build a strong record. You can select any of the factor and go through it in deep by following the instructions given in the report. By taking into consideration above mentioned sections you can read your credit report and understand it. You can also find out errors if there are any and correct them. What if there are any mistakes in Credit report? The first important thing that you should do while reading your credit report is to check the information given it the report is accurate or it has any error or mistake. If you found any wrong information in your personal data, then contact to the reporting agency for correcting the information. If you have anything wrong in your account or credit related information then contact to the bank or the lender, check for the status of your account or credit and report it to the credit reporting agency. It is your responsibility to check your report and correct the information. Till now we have discussed what a credit score and credit report is. Now in this chapter we will see the factors that affect on your credit score. We will also discuss about some of your common routine habits or we can say them mistakes which to avoid your credit report being messed up. Your credit score ranges from 300-900 and there are some factors which you do in your routine life which has impacts on your Credit report knowingly or unknowingly. There are 5 such factors which have their contribution in affecting on your credit report. See the list in the image. If you want to have an excellent credit report then you have to be super careful about your credits, loans and EMI's. Because a little bit of laziness can also have a bad impact on your Credit score. So to maintain this balance you should keep in mind the things you should and should not do to improve your credit score. How to apply for Credit report? If you have a poor credit score you may lose you job or it will be difficult for you to find a new one. In many cases bank don't approve the loans and event don't offer their credit cards just because the applicant have a poor credit score report..
An individual having bad credit score may also have to pay higher insurance premiums than the regular ones. It would also be difficult to start a new business with a poor credit report. Now you must be aware of the importance of a good Credit score or CIBIL report. It is like your identity in your financial life. So it your responsibility to maintain your CIBIl report. You can build up a good credit score report by avoiding some small mistakes in your routine life. With a little bit of efforts you can protect your CIBIL report from being messed up. Here are the tips for you. Try to follow them on a regular basis and you will see the benefits in your credit report. In your daily routine sometimes you make small mistakes which you thing are not that big and our can correct them later. But these small mistakes can lead your Credit report towards bad score. Here are some of those small things which you should avoid in your day-to-day life to build a good credit score. Many people pay the loan bill late or sometimes miss it just because of laziness or by thinking that they will pay it later. This will not just make you pay the due fees but also makes your Credit score uglier. Because every time you make these mistake, bank reports it to CIBIL and this will affect your CIBIL score badly. It's not too late if you correct your mistake now. If you have missed your EMI's or loan bills for some month and are now worried about your credit score, then don't worry. You still have a chance to get a good CIBIL score. Just pay the bills now and from now on don't miss is or pay it late for next 1 year or 2. You can improve your Credit score by being punctual. It was a time when using so many credit cards was trend and it was common to have 5-6 credit cards. Many people had lots of credit cards just for a show off. But now you may need to pay for having credit cards more that its limit. Having a loan or credit more than its natural limit is a big sign of negative report. If your credit limit is 50,000 and you are using 40-45,000 then it seems like you are too much dependent on your credit. This can have a bad impact on your credit score. In other case if you have 2 credit cards both having limit of Rs.10,000. If you use Rs.8-9000 from one card and Rs.0 from other, this too can have negative impact on your credit score. To avoid this you should not reach your fullest credit limit. If you use Rs.5000 from one card and Rs.4000 from another card then in this way you can maintain your good credit score. And if you think you can not control your expenses then tell the company to increase your credit limit. Credit card loans , personal loans are kind of unsecured loans. and having a high amount of unsecured loan is a bad credit. If you have 80% of your loan from credit card debt and personal loan then it may affect badly on your credit score. It seems like your expenses are depended on these credits rather than your earning. In other case if 80% of your loan is secured debt like education loan or home loan then it will be a different thing. So make sure that your total unsecured debt is less than secured one. If you cant do that then try to repay the unsecured debt first to minimize the ratio. Suppose you have a friend, a good friend actually, he is with you from last few years, you shared food with each other and you know each other very well. You know that he has a bad habit of borrowing money and not returning it back. If he asks you to become his guarantor for his loan the what will you do? I advise you just tell him "Go to hell". If you guarantees a person for loan and then he ran away without paying it back then you will be held responsible for his case. This will not only affect his credit score but also impacts in a bad way on yours. Be the one for your brother but not for such friends. Because it is good to become guarantor of your family member but before doing this for any friend who you know has such bad habits, think of it once before. Lets take an example before explaining. Suppose 'A' and 'B' are two different persons having debt on them and both are paying returns regularly. 'A' is paying his loan bills on time from last 5 years continually. Whereas 'B' is paying for his debt from last 5 months. Who's credit score will be good? It is 'A'. Here though both of them are returning their debt regularly, 'A' has a long record of being punctual than 'B'. So 'A's credit report will be much better than 'B'. Now you must have got my point. Longer the history, better it is. Don't avoid to use credits or take loan, but use it with a limit and pay the returns on time to build a good credit report. As we have discussed above CIBIL have record of your every related action, from inquiries to applications, If a person continuously asks for loan, insurance, credit cards and all then it shows his hunger for credit. Some people inquires for the loan but in real they don't actually want any. If you really want ant loan then first decide the bank then apply for it. Don't just apply for the same in 5-6 banks at once. So it is better to keep some time gap between inquiries. This is the worst mistakes of all. There are people who first take on a lot many loans and then are unable to pay it. So they either ran away (companies mark it as “write-off”) or at best just made some payment and settled the loan (companies mark it as “settled”). And this will make sure you are blacklisted for at least 7 yrs. You will not be given any loan, you can cry your eyes out for that 1 small credit card and you will be treated like you are nothing. It is said by experts that a person should check his credit report at least once in a year to maintain a good record and check the accuracy of the information recorded in the report. As per Fair credit reporting act (FCRA), a person is legally entitled to get at least one credit report in 12 months from each of the credit reporting bureaus. In this chapter we will see the procedure to apply for a credit score report. When does a person need credit report? Till now we have discussed a lot about the areas where your cibil report is necessary. Mostly a person needs it while applying for any loan or credit. When a person applies for the credit to the lender or bank, the very first they will do is sending a request to a credit report bureau for your credit report. see the image given below, you will know the exact procedure. Once the lender gets this report and check for the score, they will then decide whether to approve your loan or not. Now let see the procedure to apply for the credit score report. Applying for credit report is easier now a days as the online mode is available for requesting your report. To apply for your credit report you just have to visit the official site of the credit bureau and then by logging in to your account you can complete the procedure of application. Or there is one more way, visit the website www.annualcreditreport.com and complete the further procedure. This is the website design by all the credit bureaus together, so that you don't need to apply on their own websites separately. Let me explain each step with a little bit of description. 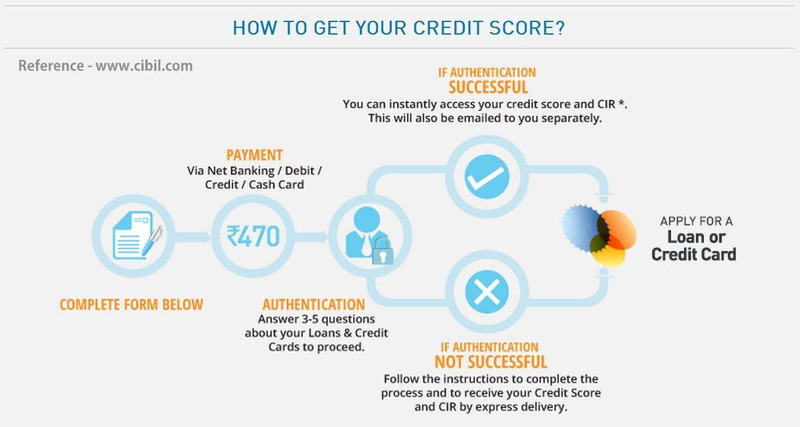 Visit the website of the credit bureau or the visit in www.annualcreditreport.com and login with your ID & password, Check the information and confirm that its your account and then click on 'apply for credit score' button. After clicking on the apply button the form will be opened on your screen. Fill the form accurately with the relevant information which is asked in the form. The information will be like Name, Security number, address, contact information etc. Once you fill the form completely you will be directed to the next page. After completing the form you will lead to the payment page which is around Rs.450-500. You can make the payment through Net-banking or via debit/credit cards. In this step you will be asked few questions related to your loan or credits. This is just for the authentication purpose. If this authentication process goes successful the your request for your credit report will be finally send forward and if the authentication is unsuccessful then you need to find out the error and apply again.